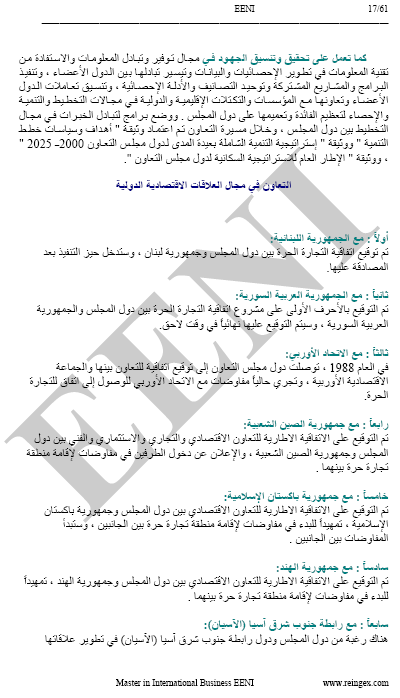 Syllabus of the Online Course (Subject): Cooperation Council for the Arab States of the Gulf (GCC). 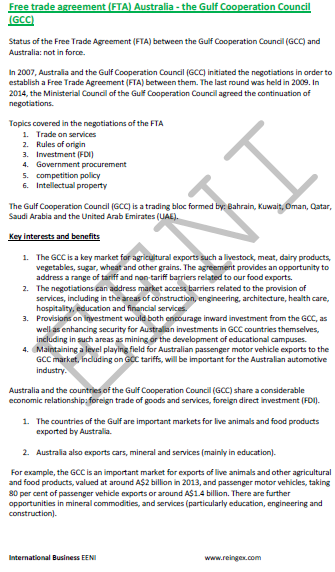 The Cooperation Council for the Arab States of the Gulf (GCC) is an international trade bloc involving the United Arab Emirates, the Kingdom of Bahrain, the Kingdom of Saudi Arabia, the Sultanate of Oman, the State of Qatar, and the State of Kuwait with many economic and social objectives: the Gulf Cooperation Council Common Market and Customs Union. 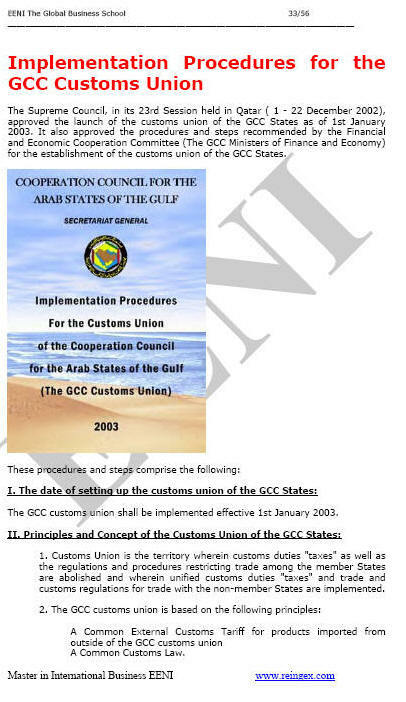 In 2002, the Supreme Council of the Cooperation Council for the Arab States of the Gulf (GCC) approved the launch of the customs union of the Cooperation Council for the Arab States of the Gulf States (entered into force in 2003). It also approved the procedures recommended by the Financial and Economic Cooperation Committee (The Gulf Cooperation Council Ministers of Finance and Economy) for the customs union creation of the Cooperation Council for the Arab States of the Gulf States. The Gulf Cooperation Council (GCC) economies have gone so far in the field of bilateral trade cooperation. They have enhanced such cooperation for the benefit of the Cooperation Council for the Arab States of the Gulf States and citizens, which would consequently improve Foreign direct investment and international trade climate. 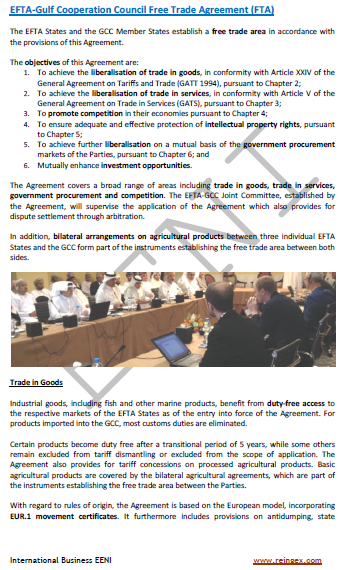 The objectives of trade cooperation between the Cooperation Council for the Arab States of the Gulf States are summed up in the effort to eliminate tariff and Technical Barriers to Trade (TBT) among the Gulf economies with respect to their export products, exempt such products from customs duties and accord them national treatment, coordinate exportation and importation policies, and create a collective negotiating power in the field of exportation and importation. The Gulf Cooperation Council (GCC) belongs to Arab Economic Area (Islamic Civilisation). Introducing the Gulf Cooperation Council single currency and establishing the Cooperation Council for the Arab States of the Gulf Monetary Union are the fruit of economic integration stages achieved so far. 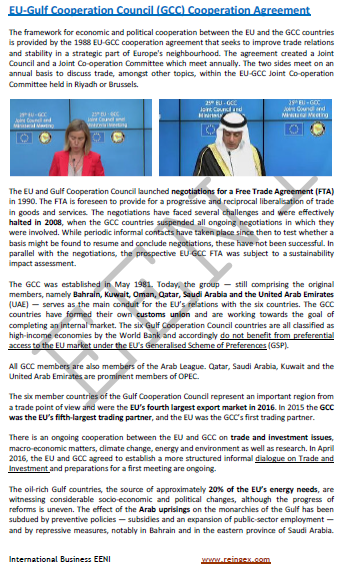 This will increase the advantages of economic integration and improve the gains of the Customs Union and the Gulf Cooperation Council Common Market, as establishing the GCC Monetary Union and introducing the GCC single currency will have many impacts on the various economic sectors, especially in the Intra-Gulf Cooperation Council trade, tourism, and foreign direct investment (FDI). These impacts will mostly reveal on the financial services and capital markets, which will reach an increasing growth and speed up developments.